1. Start with a catchy first line to grab the reader. 2. Say something nobody else has said before, while avoiding repeating what you'll read in other reviews. Dune is a brilliant story told by an incompetent fool. Frank Herbert seems a deliberate pretender at his own trade. Because of his infatuation with pretense, he comes across to me as a stranger to the real substance of the world he spent so much time and energy building. He navigates it crudely, filling it with characters that are all variations on the same theme: brooding, self-possessed, cynical, valuing perception over reality. My greatest complaint is that Herbert is constantly sabotaging his story’s narrative drive with pointless pseudo-introspective dialogue. He is fatally enamored with such dialogue. The worst of it—the most banal—he obviously recognizes, because he props it up with the cheapest of ploys: he has another character gush with praise over the insipid line. Time after time he takes the brute force route through the tangle of possibilities that the intricate story line full of characters at cross purposes with one another presents to him—missing opportunity after opportunity for sophisticated story telling. Just one example: The Guild navigators couldn’t navigate their way out of a paper bag without their drug? All inter-space travel would collapse without said drug? Puh-leez! Over and over he assembles a room full of way-too-many characters, swabs it with political tension and innuendo, and with laughably shallow pseudo-philosophy, and then has them stand/sit in static rapture of their own self-involvement and prattle on for 20 or more pages that neither advance the plot nor even produce any consequences to it. He is obviously enamored with politics—the art of appearing to be more than you are while saying less than you know. In the end, that’s what the entire book comes across to me as: an exercise in creating appearances without substance. To his credit, Herbert is superbly talented at turning a phrase. The phrasing is rich, often poetic and always well crafted; and his characteristic writing style is a pleasure to read. Usually that scores big points with me. But not here. 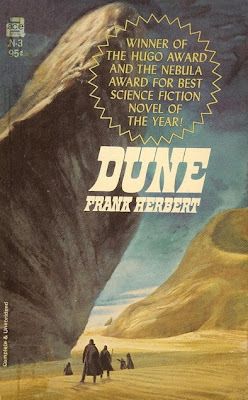 ‘Dune’ is touted as one of the most outstanding examples of its genre. I pointedly disagree.